Olympic Mountain Rescue is a volunteer organization dedicated to saving lives through rescue and mountain safety education. 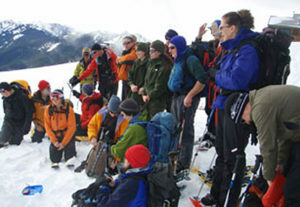 OMR is one of nine Mountain Rescue Association units that operate in Washington State. Collectively, OMR members have hundreds of years of mountaineering experience in the Olympics. We are a skilled group of volunteer climbers dedicated to wilderness rescue and mountain safety education. Learn more about Olympic Mountain Rescue's purpose and mission. We are always looking for committed, experienced volunteers. Click here for membership requirements, FAQs and our application packet. Links to publications and online resources useful to the climbing and mountain rescue community. This section under construction. More to come! Headed out? 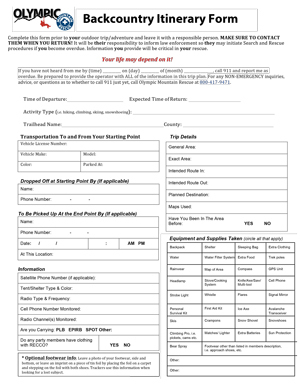 Use OMR’s Trip Itinerary to help friends and family know your intended route, timeline, and other pertinent information. It can give your loved ones peace of mind. And, it can be invaluable–even lifesaving–should events not go as planned. Olympic Mountain Rescue is a 501(c)3 nonprofit organization. Your donations are tax exempt to the extent allowable by law. We are 100% volunteer-led, with over 60 years of history and an active team of rescue volunteers. But, we can’t do it without your support. Training, equipment, rescue mission expenses and our building restoration & maintenance all depend on generous donations from people in our community. When you give to Olympic Mountain Rescue, your contribution literally saves lives! OMR is dedicated to saving lives through rescue and mountain safety education. Interested in getting involved? Click below for information on what it takes to become a member of this skilled group of dedicated volunteers.